To speak Thai clearly and make local people understood, it is not only getting the tones right it is also pronouncing the vowels correctly. Similar to pronouncing Thai tones, when the vowel changes the meaning changes too. So you should make sure you are saying a word with a short or long vowel. For example; ข้าว /kâao/ means ‘rice’ but when we change the pronunciation to a short sound เข้า /kâo/ means ‘to go in’. 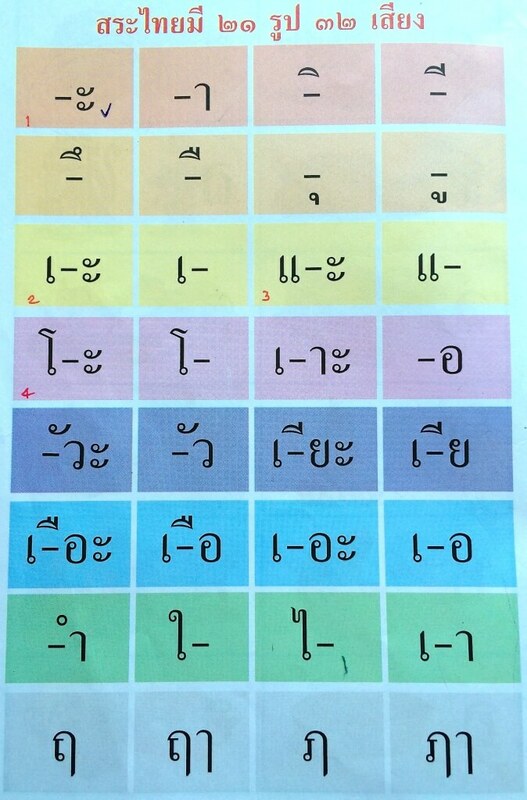 “Vowel” in Thai is สระ /sà-rà/. Long vowel is called สระเสียงยาว /sà-rà sǐang yaao/ and short vowel is called สระเสียงสั้น /sà-rà sǐang sân/. I stumbled upon your website while trying to look for tutorials on how to pronounce thai vowels. I love your lessons and videos so far and have jsut subscribed to your youtube channel 🙂 Btw, i just subscribed to your newsletter and dl the 190 words ebook. However the audio links for pronounciation was not included. Is there a link or file for that which u can direct me to? Sawatdii ka Ben, thank you for your subscription. I am sorry to hear that the audio doesn’t work. Someone wrote me an email to inform this problem before – first he couldn’t get it working then he said the file works fine on Adobe Reader X (10.1.9). Perhaps you can try to open the file on a different program. Please let me know if you can figure the issue. mam I can speak thai language in past I lived in thai.thanks to all local students of kmutnb university and my local friends.but want to learn read and write.i want pursue my carrier in thai language. seeking some support from ur side.i can join a course. That is a low tone mark. It gives ‘low tone’ for Middle class and High class consonants and falling tone for Low class consonants. I am sorry I don’t understand your question. Can you clarify please? I have a, for me, important question! Mod, thanks for rolling your “r”. My Thai teacher many years ago would never allow me to say “l” and later Thai people complimented me for my pronunciation. First of all, apologies for the delay in my response, and thank you for your kind comments. It is very common for Thai people to change the “R” sound to “L” sound. It happens automatically some how. It also happen to me when speaking in everyday life. Sawatdee ka kru Mod, i must say that you are an excellent teacher. They also have the ‘y’ merged into the sound, or end in ‘w’ that sounds like ‘ow’. I don’t see these on many standard charts (like the one you linked) but they seem to be vowels too? thank you so much for the entire website and the videos. I am goning back to Bangkok in August and I can’t wait to talk to my Thammasat friends in Thai. Can you give examples of words that use อือ เอือ ฤๅ ฦๅ? ฦๅ : There is no word using this vowel. My old YouTube channel has been suspended, I have created a new channel called “ThaiwithMod”. Please don’t forget to subscribe. I re-upload some of the videos from the old channel to the new one already. I will continue to load more, but it takes some time to edit them. Hi Mod! I just found your blog and have found it incredibly useful, you are by far the best person I have found to watch and learn from. Can’t wait for your short vowels video! Sawatdee ka Nat, thank you for reading my post. Unfortunately, I haven’t had a chance to the post on short vowels. I will do it shortly. how about the video for short vowels, you long ago promised to make, or did I miss it, I have not found it on your site. Also, I would like you to give some explanations about how the vowel signs work, because I really do not understand them all. I’ve listened to your vowel demonstration – very comprehensive! Would you consider it a fair statement to say that Thai vowels are mostly back-vowels (pronounced in the back of your throat), rather than front-vowels (pronounced near your lips)? When you enunciate, it sounds like your vowels are almost nasalized (close the air stream through your mouth and direct it through your nose). Also, the last two (unused) vowels you demonstrated remind me of Sanskrit ऋ and ऌ (written in Devanagari). Are they still used in Thai liturgical language; e.g. in Buddhist worship? btw u are an excellent teacher. Do you think it helps to have mneumonics (memory devices) or pics with the characters/letters. Also – do these vowels have tone marks – khawp khun Khap. Is the dash between – before and after vowels on your chart where vowels go in relation to consonants? I don’t know if you gonna answer this one, since this video is now “quite” old but why เอย as in เลย is never considered as a distinct vowel since it doesn’t sound﻿ like เอ+ย but much likely เออ+ย? Excellent lesson. I needed the review and eagerly wait for the short vowels. Appreciate all the help you provide. Can you do some Thai music like the national anthem or Chang song and explain the lyrics? Music makes learning a language more fun. Thank you for the lesson on vowels. What about short vowels? Also, some words don’t have vowels. It seems like you can add ‘oh’ most of the time if there are just two consonants but maybe not always. How do you know what sound to use if there is no vowel? Sawatdee ka, thank you for your interest in learning Thai with me. 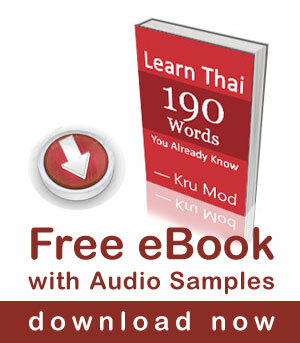 I teach one-to-one Thai lessons via Skype. I don’t have a physical school. Thank you for your message. If you are interested to have one-to-one Skype lessons, please write me at adjima_t@hotmail.com to discuss further details.